Chelsea have caught in the eye so far in the Europa League, and Kevin Hatchard believes they'll take another step towards the trophy in the Czech capital. "Chelsea have been incredibly consistent in the Europa League this season, strong in defence and ruthless in attack." With 12 minutes gone in extra-time, Slavia Prague looked as though their brave resistance against Sevilla in the last 16 of the Europa League had come to an end, and a shock result had eluded them. But football loves a twist, and a goal from Mick van Buren sparked a frantic last few minutes that culminated in one of the messiest but now most famous goals in Slavia's long history. Ibrahim Traore's 119th-minute effort should probably have been cleared off the line by Simon Kjaer, but the Danish defender fluffed his lines, and Slavia secured their first European quarter-final berth since 2000. After years of watching their capital city rivals Sparta dominate Czech football, Slavia have turned the tide recently, and are on course to win their second league title in three seasons. They are seven points clear of second-placed Viktoria Plzen. In the UEL, Slavia are still unbeaten at the Eden Arena. They beat Bordeaux, Zenit and Sevilla, and drew 0-0 with Copenhagen and Genk. For this clash with Chelsea, they won't have their full complement of fans, as the stadium will be partially closed as a punishment for supporter misbehaviour in a previous game against Genk. Influential midfielder Tomas Soucek is suspended for Slavia, which a major blow, as he has arguably been their best player in this competition. Former Manchester City forward Miroslav Stoch will look to support Milan Skoda in attack. Chelsea are the [2.98] favourites to win the Europa League, and it's not hard to see why given their relentless consistency in the competition so far. The west London side have conceded just four goals in ten Europa League matches, and they have won all but one of those games. Blues boss Maurizio Sarri is often criticised for a lack of adequate squad rotation, but in this tournament he has got things right. A few players have really come to the fore in this competition. Danish defender Andreas Christensen has started every game and has been outstanding, Olivier Giroud is the UEL's top scorer and has been running his own "goal of the tournament" and teenage winger Callum Hudson-Odoi has scored four goals and made two more. After his dazzling display in Monday's win over West Ham, Eden Hazard is likely to be rested again, with a game against Liverpool looming on this week's horizon. Giroud will once again lead the attack, with Gonzalo Higuain yet to feature in the UEL in a Chelsea shirt. Chelsea demolished Dynamo Kiev 8-0 on aggregate in the previous round, and they have been close to flawless in the Europa League. Slavia have an enviable home record, but their stadium is partially closed, and one of their best players is banned. I'll back Chelsea -1.0 on the Asian Handicap at [2.13]. Giroud to make his mark again? 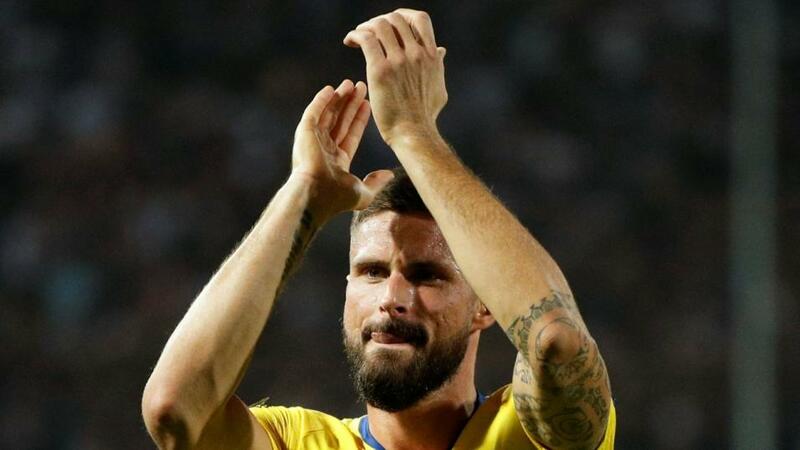 The excellent Giroud has clearly been boosted by his role in helping France win the World Cup, and he has been superb in the Europa League. Half of his shots have hit the target, he has netted nine goals and set up two more. He's certainly worth considering in the To Score market at [2.6], as is the electrifying Callum Hudson-Odoi at [3.45].